March | 2009 | My name is Kervie and I'm not here to make sense. So we dropped a press release last Thursday 3/26 and we are having an influx of submissions to our Social Media Experiment – HelpUsNameUs.com. There are obviously some good, some bad, & some ugly. As of today, we have over 1,200 submissions from around the world coming in from 6 out of 7 continents. Now we need to find someone who has a computer in Antarctica. Anybody know anyone there? We are agetting quite a buzz on Twitter – follow @HelpUsNameUs to get the latest buzz and more news on our progress. Videos and animation submissions by IC team members including yours truly. We are hoping for more “diggs” on this site to maybe reach more people. We’re using MySpace as a part of the second phase of our experiment as they’re one of the two Social Media giants. Come and be our friends as well. I will update the list of places we used as I get more data. The April 3rd deadline is fast approaching. So if you ever get a chance to enter your ideas – please do so. That Kindle2 is an amazing device. I got to play around with it and it’s a must have for any book lover or tech device collector. So thanks again to everyone who submitted their entries. Check back soon for more updates! Peace Out! Hey everyone! 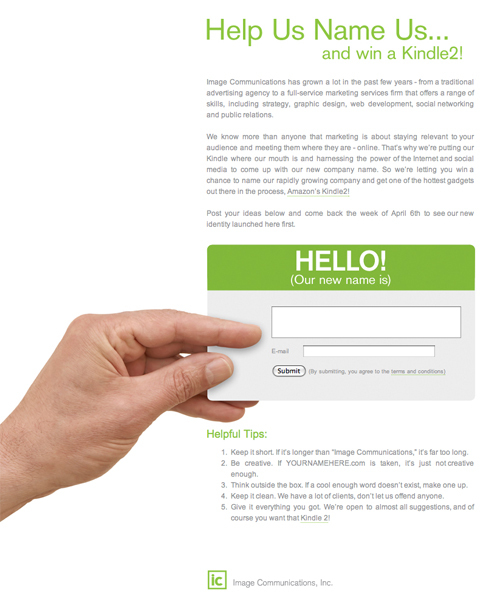 Here’s the latest from Image Communications, Inc, the company I work for. Help Us Name Us! We are in the process of re-naming our company and we need your help! We will give out Amazon’s Kindle2 – the amazing wireless reading device to the person who give us the best idea. We tell our clients everyday how important and powerful social media has become… so we’re proving our theory by using social media to rebrand our growing company. So visit helpusnameus.com before April 3 if you have some great name ideas. We have a few helpful tips listed on the site, but ultimately we are open to almost all suggestions. The new name will be chosen by our team and the winner will be announced during the week of April 13th, 2009. We will be using only social media technologies like Twitter, Facebook, StumbleUpon, employee blogs, social news sites, etc. to promote the contest. Please enter and tell all your spouse, friends, neighbors, and co-workers about it. That Kindle2 seems to be a pretty nifty device that you could have by your bookshelves or even show off to all the people you know. So I will post another blog entry to give you guys an update on the status of our search. Good luck to everyone who enters. This will be interesting! Peace Out! So I come home Friday to check my email from a long day of single and double clicking, and I receive an email from someone at Logo Lounge. They notified me that two of my designed logos made the cut for their first ever Master Library Series. The series will be a collection of logos focusing on initials and crests and it will be published next year. 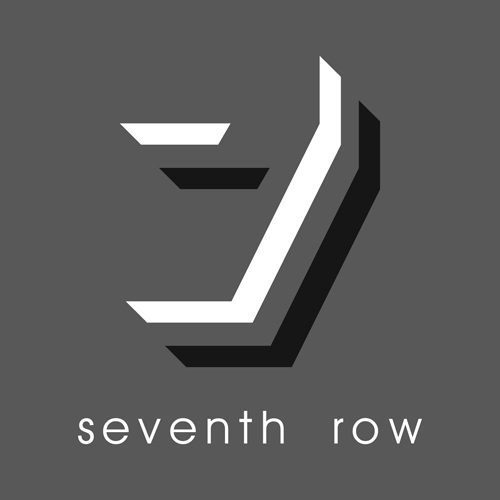 The logo for “Seventh Row” was a freelance project designed for my uncle who runs an entertainment booking agency in NYC. This was probably the first logo I created with Freehand 8 that was running on a really, really, and I stress “really” old PC. *The other logo is for a decorative switchplate manufacturer in Morgantown, WV called “Aberdeen.” The name is derived from a place in the UK. This logo was the first project I tackled when I got my first job out of college. 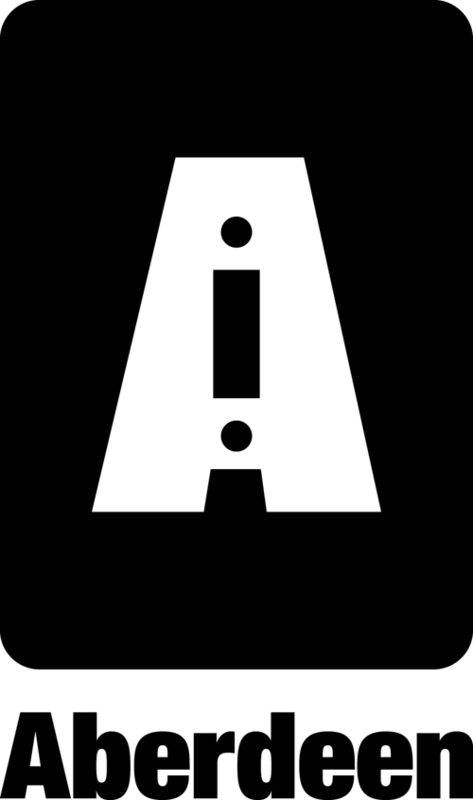 I remember using Illustrator 8 for the first time (industry recommended switch) to design the logo. Anyways, that really made my day. I submitted these logos over a year and a half ago and I’m glad that they were chosen. It really gave me some feeling of accomplishment… 10 years into doing graphic design professionally. But in reality, I’ve never entered or submitted anything for a national publication or a contest before. I’ve entered the local Addy’s and was quite successful, but I feel that this is more an accomplishment because of the international reach of the book. So to summarize how I feel in one word it would be “RELIEVED!” I’ve been looking for that one glimmer of acknowledgement for my work and I think it found it. Actually I think it’s more of a “flash” than a glimmer since to me this is huge!!! I will be adding more portfolio pieces as soon as possible. I’m working off a MacBook Pro and it’s not the fastest equipment to use while working on several graphic projects. I’ve been saving up for a new Mac Pro for over two years now, since my Dual 533 mgz G4 just decided to retire. I wonder when the new ones will come out. Rumor has it that it might not come out til early next year… but who knows. I’m sure that once it comes out, it will not dissapoint.